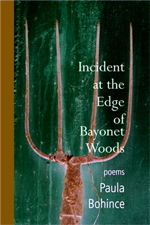 Diane Lockward Reviews Paula Bohince's "Incident at the Edge of Bayonet Woods"
our interest. The motive is never more than speculation. The suspects remain merely suspects. and reconstructing the story ourselves. Paula Bohince’s Incident at the Edge of Bayonet Woods is a stunning debut. Both a mystery and a lyric tour de force, the collection immediately takes a choke hold on the reader’s attention and never releases its grip. Poem by poem, Bohince unravels her dark story. In Section I we learn that the setting is a lonely rural farm located in the coal-mining country of Pennsylvania. Primitive and shadowed by history, the farm is characterized by mud, grime, cold winters, and poverty. The female speaker, following her father’s grisly murder, returned to this farm where she was raised, to live there and to claim her legacy of loneliness. In the poems, she struggles to get to know her father and to make sense of his life and death. Recalling the farm as it was years ago, she says, “I taste the odor of straw and millet released into fall, / the cursive of my father’s burning cigarette, / muslin curtain parting.” Thus, the stage is prepared for the father’s entry and the mystery’s unfolding. While Section II introduces the suspected murderers and suggests a motive, Bohince deliberately leaves the narrative incomplete, a strategy that works well to pique and hold our interest. The motive is never more than speculation. The suspects remain merely suspects. There is no real solution to the crime. As our speaker attempts to reconstruct a story she does not fully know, she moves back and forth between present and past, affording us the pleasure of finding clues and reconstructing the story ourselves. As she tries to remember events from her childhood, she must acknowledge the fallibility of memory. In “Landscape with Sheep and Deer,” she says, “I must have dreamt it,” and she wonders, “. . . if there were deer, wouldn’t they have leapt over?” Bohince subtly places us in that oddly delicious and ironic spot of uncertainty. Other smaller but seemingly important details, personal ones that the speaker does know, are also omitted; thus, the speaker herself remains somewhat a mystery. She has returned to the farm, but never tells us where she has been or for how long. She never makes reference to a mother. She tells us she is married, but provides no information about her husband. She speaks of herself as “twice married to the land,” and seems as much a bride to grief as to any man. Bohince’s handling of atmosphere is masterful. While the story is rife with the potential for passion, little is expressed. In “Quarry” the daughter says it would be better “if I could quarrel with these rocks, woo outrage the way / I woo sorrow. // There ought to be a slow-forming fire somewhere, / not these pale mists, which are moths, which are offerings of light / to the foiled landscape.” She notes the “stubble of weeds waiting for some emotion to occupy it, / though emptiness is its own kind of balm.” Ironically, this emptiness serves to intensify the grimness of the story and to enhance the feeling of overwhelming loneliness. As the daughter woos a sorrow she cannot feel, we feel the damage that has been done to her. Bohince also charges the atmosphere with a complex network of allusions, both biblical and classical. While the essential story is utterly contemporary and realistic, these allusions add timelessness and magnitude. Each of the three killers speaks in a gospel poem: “The Gospel According to Lucas,” “The Gospel According to Paul,” and “The Gospel According to John.” Ironically, although these young men are called forth to testify, we cannot be sure they speak the gospel truth. John refers to himself as “a snake in the grass . . ..” Details about the father and his murder are revealed in “The Apostles”; here, too, Bohince adds a touch of irony as the father referred to his three laborers, the men who betrayed him for money, as his “apostles.” In “Pond” we learn that the father’s “body lay / for three days before its discovery . . ..” Then the idea of resurrection is implied in “Adoration of the Easter Lamb” and in numerous references to lambs. Another of Bohince’s poetic gifts is revealed in the constellation of intertwined images of beauty and ugliness. In “Prayer” the speaker addresses her Lord “beneath this raw milk sky, your vision / of silvery cream comprising daylight.” The beauty of this is in stark contrast to the grotesqueness of one of the collection’s strongest images—bones. In “Trespass” we learn that when the father was paroled from prison after having served a three-year sentence for petty theft, he returned home and took his daughter into a neighboring pasture searching for bones to sell. The speaker recalls “the dreaming gnats we awakened / discovering the lode of bones. // Collecting skull, rib, sternum, spine, the dead . . ..” Similarly, in “Landscape with Sheep and Deer” the daughter reveals her father’s love of animals—“sheep of the earth, / the cloud-like sheep, and the earth-toned deer / that belonged to the sky.” She evokes the beauty of the field: “Radiant heather and tiny white tongues of clover, / soil glittering with the misery of rain.” But here again we find “bones of a field mouse, / horse flies spinning in the trough . . ..” It is difficult to encounter such images and not think of Beelzebub, Lord of the Flies. This collection’s chilling story is told beautifully by a gifted poet. That it is told incompletely and dispassionately adds complexity and irony. The reader is intrigued by the mystery, but because Bohince is a poet and not a mystery writer, she wisely sends us off with unanswered questions, leaving us haunted by the story, the characters, the setting. And certainly by the poetry.